More and more people are using social media sites like Twitter and Facebook to talk about companies and products with their friends and colleagues. Learn what drives people to share information and opinions online and learn scientifically proven best practices for spreading your content virally through social media. You'll have plenty of time for Q&A with Dan Zarrella, social media and viral marketing scientist and author of "The Social Media Marketing Book." 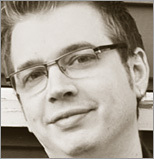 Dan Zarrella has written extensively about the science of viral marketing, memetics and social media on his own blog and for a variety of popular industry blogs, including Mashable, CopyBlogger, ReadWriteWeb, Plagiarism Today, ProBlogger, Social Desire, CenterNetworks, Nowsourcing, and SEOScoop. He has been featured in The Twitter Book, The Financial Times, NYPost, The Boston Globe, Forbes, Wired, The Wall Street Journal, Mashable and TechCrunch. He was recently awarded Shorty and Semmy awards for social media & viral marketing. Dan has spoken at PubCon, Search Engine Strategies, Convergence '09, 140 The Twitter Conference, WordCamp Mid Atlantic, Social Media Camp, Inbound Marketing Bootcamp, and The Texas Domains and Developers Conference, and he currently works as an inbound marketing manager at HubSpot.